The changing of the seasons is often used as a metaphor, even a euphemism. “She’s no spring chicken,” we say of those who have entered the autumns of their lives. We turn over new leaves and blossom (or don’t) in our careers and, when the going gets rough, spend some time in hibernation. This morning, for example, the sun rose at 5:50, and it will set at 10:05 tonight, at which point we’ll have had sixteen hours and fifteen minutes of daylight. This is about five and a half minutes more than yesterday, and the same amount of time will be added tomorrow and the next day, until the June 21. On this day, the summer solstice, Anchorage will experience nearly nineteen and a half hours of sunlight. But like I said: it’s a place of extremes. On our winter solstice, we get just under five and a half hours of daylight. December and January are dark. Like bring-a-headlamp-to-walk-out-to-your-car-dark. Like leave-in-the-dark-and-come-home-in-the-dark dark. Dark. 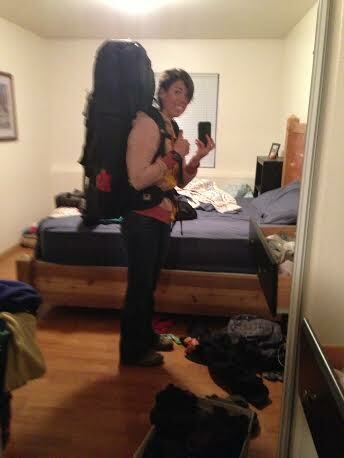 Exactly one May Day ago, I tried on this impossibly heavy backpack in my incredibly messy bedroom (some things never change). After months of vitamin D deficiency, you can see why I might be excited for the spring equinox and its successor, May Day, which I like to think of as Easter-for-Pagans. As I enjoy my sixteen hours of 60-degree weather, it strikes me how much my life has changed since last May Day. I was headed into the Talkeetnas to spend a week trapped in a tent, though I didn’t yet know it at the time. I was filled with anticipation and trepidation, and had no idea what it felt like to carry around a ninety-plus-pound pack for the better part of a month. Lately, I spend a lot of time caught between nostalgia for seasons past and anxiety for what the next trip around the sun will be like. It seems like an awful waste of a sunny afternoon, which is the topic of this Mary Oliver poem—a much more eloquent ending to this post than I could hope to produce.